We're pleased to announce the Entegra Coach Owners Association GATHERING at the FMCA International Family Reunion in Minot, North Dakota. Wayne Baumann has agreed to be our Wagonmaster for this gathering...Thank you Wayne! 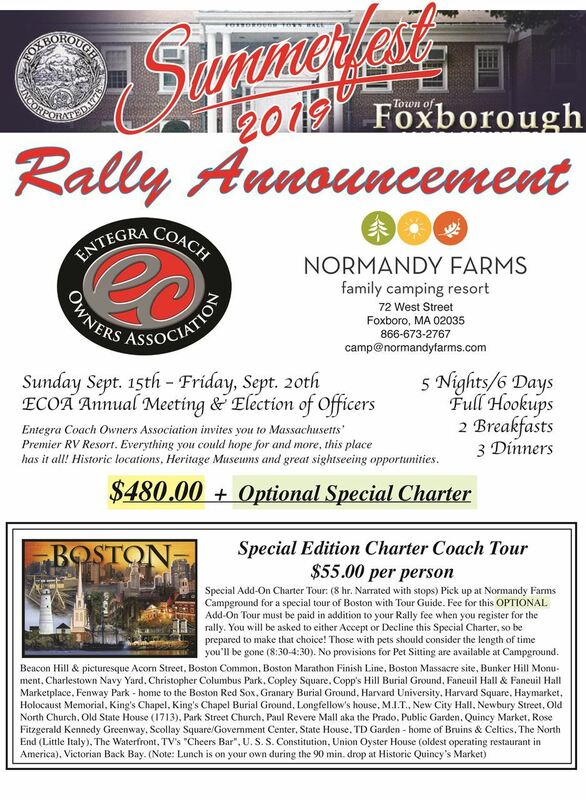 Click on the above link and sign up for the FMCA Rally and add 30amp Electrical Service ($410.00 total EARLYBIRD pricing). ALSO...mark on your registration that you will be joining the Entegra Coach Owners Association CARAVAN, so that you can be parked with us. 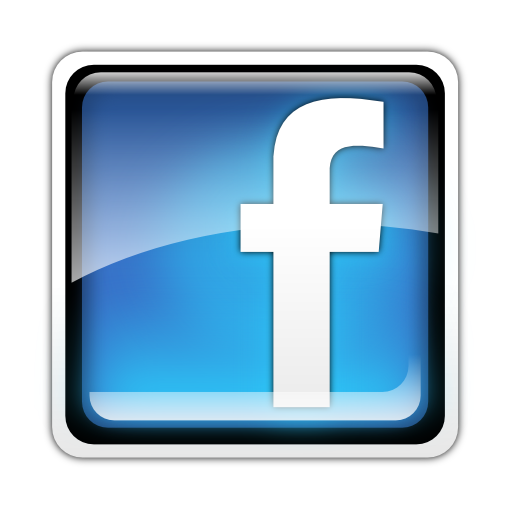 NOTE: If you have not yet joined the Family Motor Coach Association, you will need to do so. ECOA members must also be members of the FMCA. You will also need to select how you want to handle receiving your credentials....either through the US Mail or hold your documents at Will Call at the fairgrounds. Register with the ECOA on our website so you can get on the CLUB's list for Minot. THERE IS NO COST FOR THIS REGISTRATION, but it is vital to get your name on our list....otherwise, you won't get the final instructions for arrival and parking. Click the grey Register Button on the left side of this page for Club Rally Registration. IF YOU HAVE ALREADY REGISTERED WITH FMCA.........please call FMCA at (800) 543-3622, and ask for the Caravan Registration Desk to inform them you should be included with the Entegra Coach Owners Association group. On the FMCA form, you will see lots of different electrical options. Our ECOA Club will all register for 30amp electrical. If you register for any other option, you will not be parked with the group. If you have already registered with FMCA, you can change that by calling the FMCA Office. We are scheduled to be parked a DAY EARLY....Tuesday, August 13th. (the Event starts on Wednesday (no charge for the extra day). You will receive a last minute email that will detail the arrival location and time so we all meet in the Holding Area for parking together. Also note the FMCA Event ends on Saturday, August 17th, but we will stay overnight and depart on the 18th. Wayne will send out a sign for you to Print and Display in your windshield to help the parking crew direct us to the holding area, so be sure to notify him that you have registered for the ECOA group for the Rally. You will also have some credentials in your packet for this. Occasionally, your packet will contain a different arrival day and/or time. Our Caravan arrival instructions will supersede those instructions as we are all parking together. FIRST TIME ATTENDEES: Your credentials will state an assigned arrival time. You can ignore that if you are camping with the ECOA group. Our group instructions supersede the individual arrival instruction. 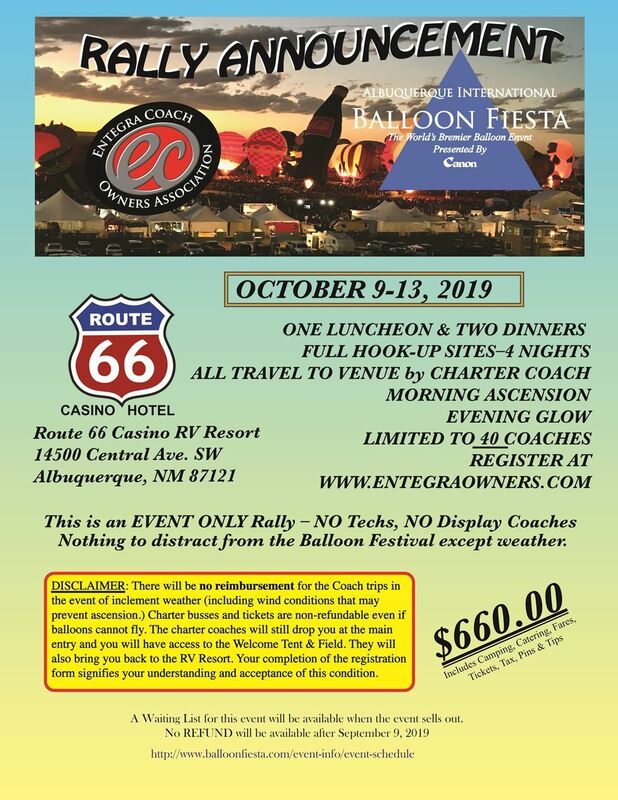 This is a special invitation to all ECOA members who have always wanted to attend the Albuquerque Balloon Festival. We have reserved 40 sites for club members October 9-13, 2019 at the Route 66 Casino RV Resort in Albuquerque. Not Dry Camping! YOU WILL HAVE FULL HOOKUPS, 50amp+Water+Sewer. The Rally includes a Welcome Dinner, a Luncheon after the Morning Ascension on Thursday, and a Departure Dinner on Sunday, all Catered by the Route 66 Casino. 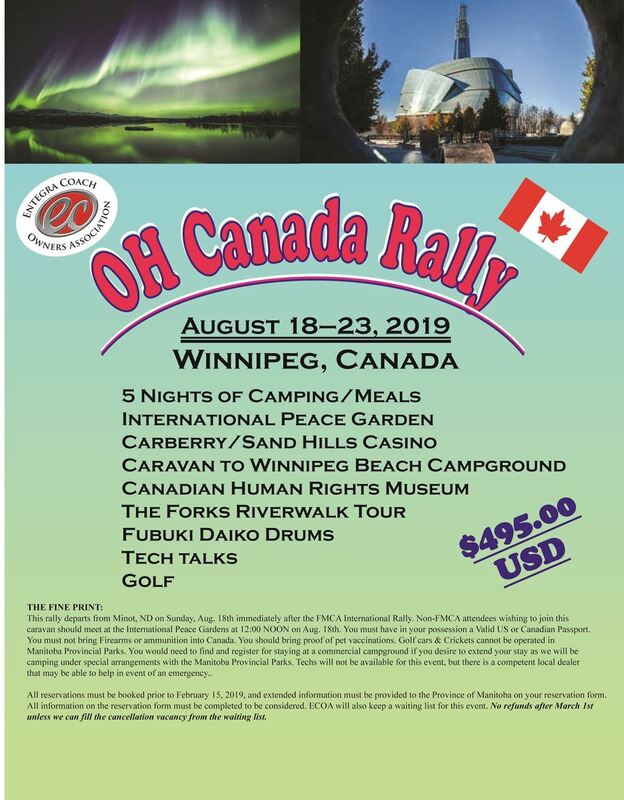 Cost of the rally includes tickets to a Morning Ascension & Special Shape Rodeo on Thursday and the Evening Glowdeo on Friday, Charter Coach express travel directly to the Launch Field, 2 Event tickets for each event, Access to the Welcome Tent and your return trip back to the Casino. Unfortunately, because of the demand for commercial coaches during the Balloon Fiesta, these coaches are scheduled for these specific events only. If for some reason the balloonists cannot fly, the busses will be able to return you to the campground but no other option for coach transportation to and from the Fiesta will be available as all area coaches are booked well in advance of the Event and will be unavailable. These coach commitments are for the specified dates and times only. No refunds will be available. Should you wish to make additional trips to the venue, you will be able to take a shuttle from the Cottonwood Mall for a nominal fee via online registration. These are the Park & Ride Tickets and transportation is via school bus shuttles directly to the Launch Field. Or should you wish to challenge the traffic and drive yourself, you can purchase tickets online without the transportation charge. See RED link below. WE WILL NOT PROVIDE ANY TECHS FOR THIS RALLY! Please be advised, we have a LIMITED NUMBER OF SITES, and you MUST REGISTER BY MAY 20, 2019. After that, our reserved sites will be released.